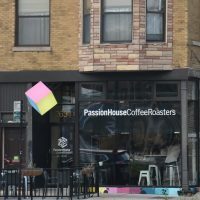 Passion House Coffee Roasters is just off Milwaukee Avenue, part of a cluster of coffee shops around Logan Square that I visited last Sunday, including Buzz Coffee Roaster & Baker, Intelligentsia and Gas Light. It’s on North Kedzie Avenue, directly opposite the Logan Square metro and bus station, with a fenced-off outdoor seating area on the far side of the pavement, where there are four tables (and ten chairs) all lined up in a row. The front of Passion House is entirely glass, with inset glass double doors on the left. Inside, it’s split into two, the front section occupied by the counter and a minimal amount of seating, the bulk of which is to the rear. The counter’s set back from the window on the right, leaving space for a pair of two-person tables. There are also two stools at the front of the counter, a sinuous, curvy affair that gets wider towards the back. The till’s on the front curve, along with the cakes, followed by three grinders (house, decaf, single-origin) and a two-group La Marzocco Strada. This is on a curved section at 45⁰ to the rest of the counter. Finally, at the back, are twin SP9s and an EK-43 grinder. Opposite the counter, on the left-hand wall, is a set of retail shelves, beyond which, Passion House widens slightly on the left, but what it gains as a result is more than lost on the right, where a series of enclosed rooms running along the right-hand wall behind the counter, starting with the toilet and continuing with two staff-only rooms. There’s a long, stand-alone bar along the left-hand wall with eight bar stools, while an eight-person communal table with low chairs occupies the centre. A pair of two-person round tables, each with one chair and one low stool, are between the doors to the right. A fire exit occupies the back wall on the right, with a narrow window in the centre, another two-person table in front of it, and a final two-person table in the left-hand corner. The ceilings are very high, with white-washed brick walls, a wooden floor and wooden tables, offset by white chairs and exposed air-conditioning ducts. With the windows at the front, it’s very bright, although there are plenty of lights, particularly over the counter. Passion House roasts all its own coffee, Phoam (espresso) and PH (bulk-brew) blends joined by rotating single-origins. The espresso changes weekly, while the pour-over options changing every two or three weeks. Having not seen an SP9 before in America, I had to have a pour-over, the barista recommending the direct trade Peruvian Templo de la Luna. It was the last of the lot, so you’ll have to wait until next year if you want to try it. Even newer to me was the filter method used in the SP9, the Fellow Stagg pour-over dripper. A steep-sided, flat-bottomed, double-walled cone, this gives, according to Passion House, excellent reliability and thermal stability during brewing. Based on what I had, it lived up to its billing, the coffee proving to be very smooth, delicate and drinkable, maturing considerably as it cooled. This was served in a small, Chemex-shaped glass carafe, a doubled-walled glass on the side. This had a cylindrical outer section and a matching, Chemex-shaped interior. All this came on a lozenge-shaped wooden tray with a small square of shortbread embossed with the letters PH, which was delivered to my table at the back. It’s these little touches that I love. I also had a slice of the spinach quiche, served warm. Quiche, when done well, is a wonderful dish for a coffee shop and this was done very well indeed. This entry was posted in Cafe/Roaster, Cake, Chicago, Coffee Shops, Coffee Terraces, Evening Opening, Laptop Friendly, Lunch, Retailers, Stations Nearby and tagged Chicago2018, include, Passion House by Brian Williams. Bookmark the permalink.